The Annapolis Royal Historic Gardens Society hosts an Annual Benefit Dinner and Auction each Spring. 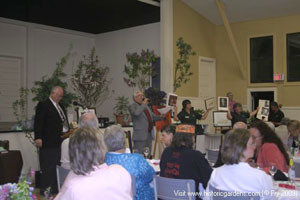 The 2011 Spring Gala & Auction was held Sunday, May 29, at the Annapolis Royal Legion & Community Centre, raising almost $20,000 for future maintenance and development of the Historic Gardens. A wonderful meal, a great social time, and a terrific selection of gifts, artwork and plant material. Our thanks to all who supported this event! Plans are underway for another great event in 2012. Stay tuned for further details!